First line: "One summer night I fell asleep, hoping the world would be different when I woke." Fifteen year old Ari is a loner without many friends until he meets Dante at a local swimming pool. The two of them quickly hit it off, and begin hanging out over the course of a long hot El Paso, Texas summer. This is a lyrical book with a slow and easy pace. I thought it really captured the way that a summer vacation can feel so long and boring, yet studded with emotional highlights for teens who don't have much to do over the break. The feeling is very masculine but also very sensitive. So often, sensitive, emotional boys in fiction are derided as "not realistic" but here, Ari and Dante's voices feel quite genuine. Ultimately, this is a sweet and tender story about two teens who become best friends and eventually more. The boys each come from very close-knit Mexican-American families. The closeness they share with their parents is really heartwarming, and the way their families completely accept them is refreshing. Ari struggles with the fact that his older brother is serving time in prison for a homophobic hate crime. Dante is impatient to take things to the next level and ends up kissing other boys while he's waiting for Ari to come around. Eventually, after having worked everything out, it does seem like they'll end up together forever. 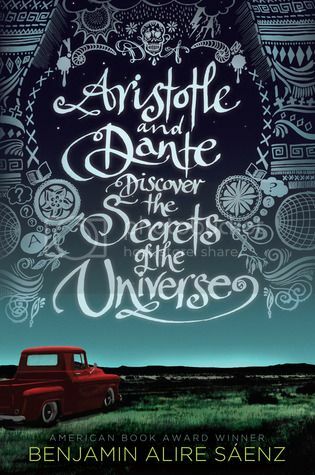 I think that there are definitely more upbeat, faster-paced gay-positive books for teens out there, but Aristotle and Dante Discover the Secrets of the Universe offers a nice happy ending for the two leads.